We reserve the right to inspect all boats and equipment for damages. in advance through email with a PayPal invoice. All rates include a PFD for each participant. Canoes...40.00 per boat, per day. or 1 adult with 3 children under age 12. 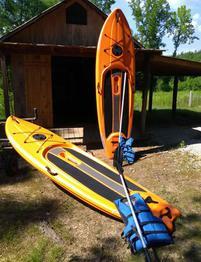 Single Kayaks...30.00 per boat, per day. There may be extra charges if boats and equipment are not returned at least one hour before dark. Shuttle service is offered for those who are not able to transport the boats themselves. The shuttle fee is per group/trip not per boat. to those renting our boats.